its not a new update. its version 0.40 . the current version is 0.43. and its for any archetecture not just armv8. its just a reposted older version of the app. want some malware use 4shared. Header of the Russian forum has not been updated for a long time, all the new builds on the forum pages, so version 0.40.
i didnt see your pic. i will look a 3rd time . wonder why its not on his github account, he has the project forked but hasnt touched it. huh, no changelog but the overlay has been at least partially redone in the pic. and the other link, the one that wasnt updated ? i have so many question foremost being why release through 4shared when you have a github account and the project already forked, but this at least looks viable. going to compare the pc release changelog against .....what? i guess its time to break out apktool and have a peek. mygui is as good a place to start as it has clearly been modified. really? then my device package browser is lying to me. it says version 0.40. ill look again if you insist but, i already downloaded it when i saw your post. yeah man, it clearly says 0.40. there is what appears to be armv8 build i missed but it is also 0.40. the date states it was uploaded in September. the armv8 copy was compiled by someone else, but it still the older build according to version history. its xyyz build not a fork, just recompiled for armv8. i cant see how compiling for 64bit when it was universal would help and theres no changelog but there wouldnt be if you didnt change anything. my earlier statement of there being no armv8 build is incorrect but, on the matter of it being build 0.44, not according to version history. the name SandStranger does however ring a bell. but that isnt who compiled it according to the site, says xyyz for the universal and sylar for armv8. im trying to place the name .....im pretty sure it was a while back, before the ok had been given to go ahead with the mobile port for bethesda so nothing ever became of it, but the name maybe connected to the original shows in forks. but if he did make the armv8 build he for some reason didnt use his github account for the project and he didnt take credit for compiling. the person who did take credit....hang on i forgot i saw him too. i was mistaken he wasnt one of the original project devs and sandstranger does have a github page open with a fork of the project but he has yet to add any commits, its just xyyz's source . if you happen to know the reason behind the 4shared release id be interested. he wrote that he made the port many years ago, but since bethesda threatened and wrote angry letters to him, he left with github. He boasted of the port, but no one believed him, and to prove it he laid it out for us. So that there is no misunderstanding: the result was that Bethesda is okay with an Android port of OpenMW (and they recognize that as a GPL engine-recreation that does not distribute Bethesda assets, it's legally okay). 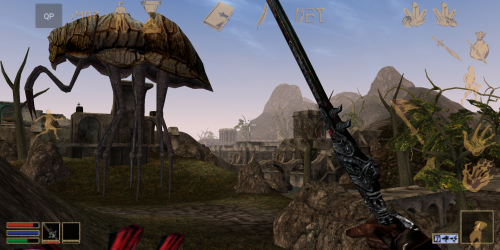 However, an agreement was made that OpenMW would not advertise Android versions running Morrowind. You can read the whole e-mail chain here. Thanks, very informative. I think before Bethesda had plans to port the game itself to mobile platforms, as the Roskstar games did in 2014, but now it's not exactly interested in it, because all games are now tied online with Donat. i personally think the ui looked better in white, the beige is hard to see in the dark. But yes, I chose this color, and made them less so that the interface elements become less noticeable, because it is more important to see the game, rather than the interface. I also added a dark color to make the icons better seen in both light and dark. I'm excited to see that development in an OpenMW fork has had so much interest that it's climbed to over 50 pages! However, this presents a lot of challenges. It's difficult to find specific information and to follow conversations when there are parallel conversations about feature development and support. Additionally, it's difficult to moderate, and we recently cleaned up a bunch of personal attacks. For that reason, I'm going to lock this thread. However, the forum moderators are discussing how to create a space where Android development can continue to be talked about. This will likely be a new subforum dedicated to OpenMW forks. Thanks to everyone who contributed to this thread, and I hope to see more discussion in the future! Good news! We now have a new place to talk about Android ports! Head over to our new Other Forks and Ports subforum and ask your questions about the Android port, or any other ports, over there!